I have seen many questions in the forums that how can we bind the CheckBox list from the database via Ajax. There could be many ways to do in an ASP.NET but I will be using the one of the most efficient options available . In this post, I’ll be using jQuery Ajax to get the data from the server (that will be fetch the data from database) and then will create the CheckBox list dynamically. You all must be knowing, I am fan of jQuery. The kind of neat and clean code and the power provided by jQuery at Client side scripting is unmatchable. In this post I’ll be discussing about accessing List controls and manipulating it with the help of jQuery. Hope you all like it and also will able to apply with other controls as well. 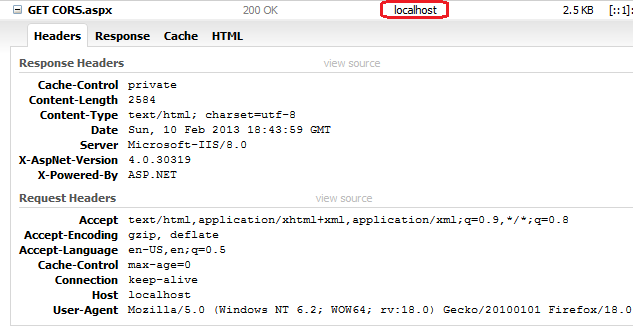 Last few days ago, I was woking with HTTP handler. Here I was required to call handler from Client script. Later I found, that I need to pass some data to handler and also recieve some from it. So I was looking for if there is some way we can pass some data to handler in some format and can recieve. So Here I am going to share, How we can call a HTTPHandler from jQuery and can pass some data to handler and receive as well. Recently, Microsoft announced three jQuery plugins as Official plugin. 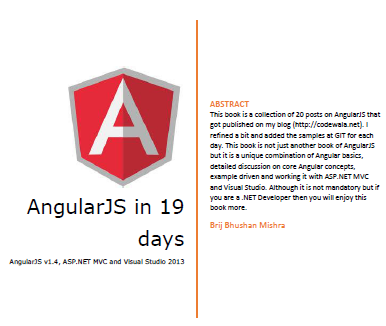 I found all of them very cool feature for web development. I have already written articles about the first two. Please find the link below. I think, you all must have found the above articles very useful and will be using in near future or some of you might have started using this. I would request you all that to share your views about the article, which will be very helpful for me in better writing. Now, In this article, I am going to discuss the last feature that is Globalization. When we say Globalization, the thing that comes in our mind is resource files. ASP.NET itself provides very good facility to cater the needs of Globalization.But which requires a postback, so it doesn’t look nice and not good in performance as well. jQuery also provides us a way to implement the globalization, with supported plugin. Again, I am writing few common points that I wrote in my last two Articles, for the new readers. So Globalization allows us to develop an application, which provides the option to localize the application in different cultures/languages. Now as we are working in global environment and serving the entire world, it becomes the necessity, to provide the globalization feature to our application. So in this article, I am going to discuss, How we can provide the Globalization feature with the help of jQuery. jQuery already comes with VS2008/2010. But if you are working VS 2005 then you can download from the following link. So in this article, I am going to discuss, How we can utilise the Globalization feature of jQuery. jQuery provides us the power to format and parse date, number and currencies in different cultures. jQuery plugin defines over 350 cultures that currently supported by the plugin. There are languages those are common in few regions/countries, but the formatting of numbers, currencies and date varies. Like English is spoken in several countries USA, UK and other various European countries. For these we have several cultures defined, that is used to identify the uniqueness amongst these countries. This plugin comes in two flavors. the cultures supported by the plugin. Another way,Plugin has also culture specific js files, that can included based on cultures that are supported by the application. jQuery.culture:This holds the culture information that is currently set and is used in default case, i e while formatting various values this culture is used if no culture is specified. This method is used to format the date, number and currency in the given format string. This method is widely used. This method works in similar way as preferCulture but it returns the best matching culture and don’t set the jQuery.culture to it. There are many more functions like jQuery.parseInt, jQuery.parseFloat, jQuery.parseDate etc provided by the plugin, that can be used for several specific purposes.I have discussed some of them. Here In this section, I’ll be showing you some examples. 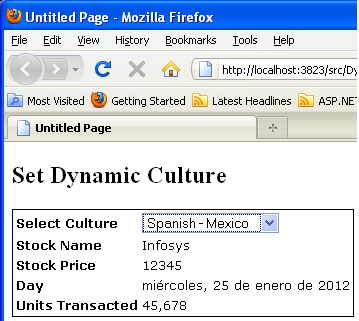 First Example:: In this example, I am displaying the stock deatils of Infosys on a specific date. It includes the price and number of unit sold on a specific date in two different cultures. Let’s see the running application. 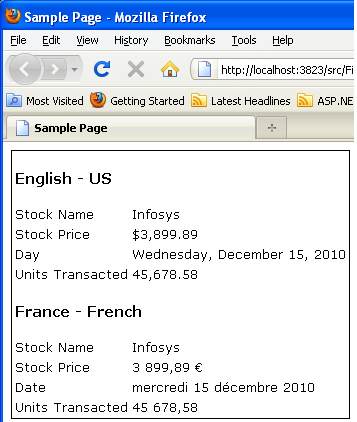 Above as you can see, I am displaying Stock details Infosys in two different cultures English-US and France-French. So I have included three files here. 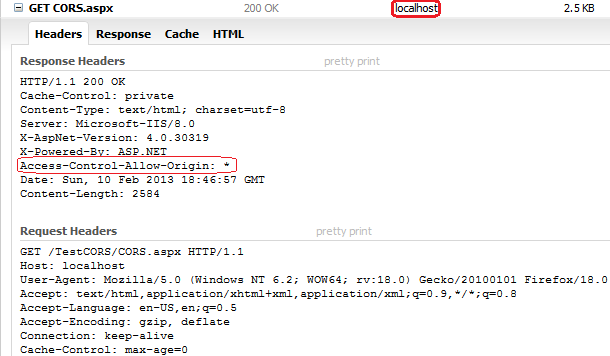 First the jQuery file the common Global file and last one is the file that contains all culture specific details. As you can see from the above code, that I have used the preferCulture method to set the culture and format method to format the various data like price, date and units here. So above one is the simple example which describes that how the plugin works. Now in this example, I am talking about another scenario where user may want to select the culture dynamically, and want to get the page updated accordingly. In my sample example, I am having one dropdown, user selects the culture and page is getting updated accordingly. First lets see the application. cultures that are going to be used in the application, then we should go for culture specific files. In this code, I have taken a dropdown with multiple cultures. One can select the desired culture and page will be modified accordingly. I have used the same form but I have called preferculture method based on the selection of dropdown. Rest code is same as above example. This feature is very useful for the applications targeting the entire Globe. As you are moving forward for RIA applications, this plugin of jQuery could be key. Hope you all must have enjoyed my above article. Please share your valuable feedback, that will help me a lot for better writing. Recently, Microsoft anounced three jQuery plugins as Official plugin. In my last article, I discussed about the jQuery Templating. You can view that Article here . development/scripting, to provide fast and very trendy/flashy look and feel. Data linking.This helps us linkling the data and the UI. with VS2008 and also available with VS2010. to provide better web based tools to their Clients. 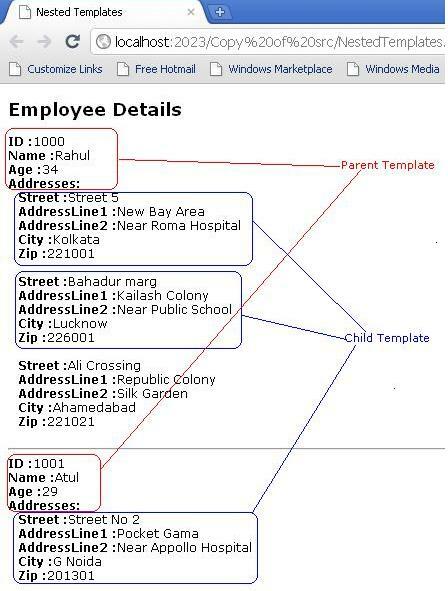 Data kinking provides us a way, to link our data/objects to UI controls. the controls on UI will also get updated (In case of two way linking). by the jQuery plug in. written and also error prone. There are several options to link the data. I have explained it with one sample. Now lets go through the code. <td><input id="btnShow" type="button" value="Show updated object"
<td><input id="btnAdd" type="button" value="Add vehicle to store"
buttons, one to show the object and other one to add it. linkForm method for the plugin as shown above. 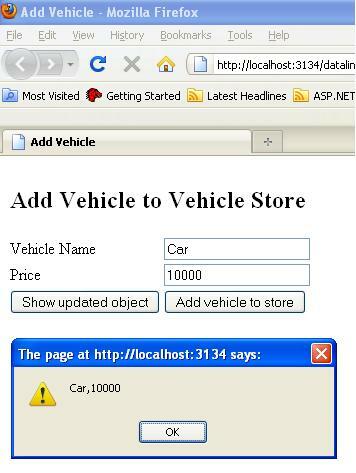 The above code is self-explanatory.AdVehicle() is called to add a vehicle using Ajax call. As you can see, I have a converter with Price, that will return only numbers and dot. conerter and the setting to property Price of the vehicle object. It also do all the things as above but have one more feature. You can also update the object from code also, as soon as object will get updated that will also be reflected in the UI. object, both UI and data will always be in sync. 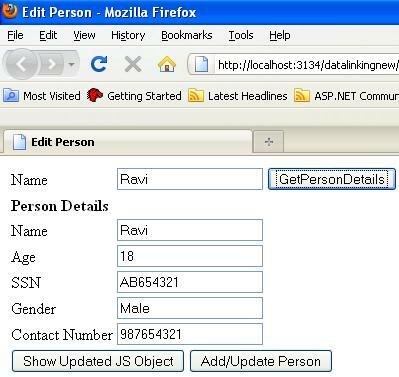 <input id="Button3" type="button" value="Show Updated JS Object"
<input id="Button2" type="button" value="Add/Update Person"
a button to fetch the requested person from the server. person. We’ll see the code in a moment. //Will be called, if ajax call gets failed somehow. the person object, that always gives the most updated and synced data. //This method will return the searched person. as discussed in above code. object at any point of time, when one wants. feedback, that will help me a lot for better writing. jQuery templating is becoming a new buzzword for the new Web applications. One cannot avoid jQuery in web applications. Currently most of the applications are using jQuery heavily. It provides very good look & feel and better performance. jQuery is becoming more and more popular day by day. Even it was integrated with VS2008 and also available with VS2010. jQuery is open source. Due to its features, Microsoft started to support jQuery team and also working with them, to provide better web based tools to their Clients. As we are working on Client server architecture, most of the things are done by the server itself. 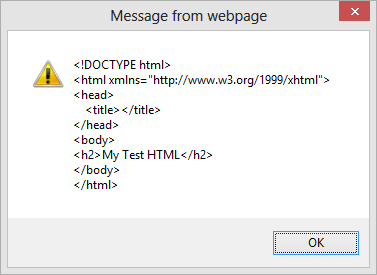 Server sends the HTML response to the Browser and browser just display it. Earlier, we were not doing lot of things at client side, Normally, some validation and little bit more at client side. With the help of Ajax call from Client side and retrieving data in a very convenient format in JSON, it really becomes easy, to start moving server side code to Client side. Means the data travelling from server to Client, is not the whole HTML response but it is just data that we have to show in different HTML controls. are replaced by the actual values from the data provided. 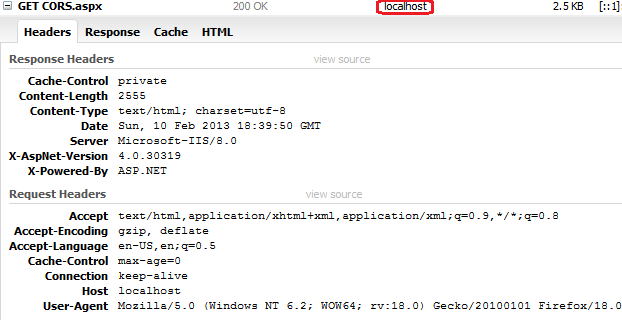 The name of the properties in provided class is same. either some database or some file or some other datasource. displayed the data on UI. Here , what I am doing,I am parsing the data that is returned by webservice. After that, I am passing it to the tmpl function. 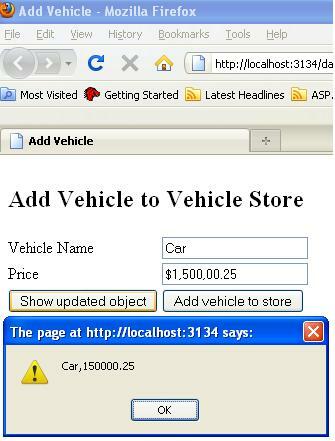 Onclick of Add button, I am fetching the data from server using Ajax call. It just append the a person detail in the existing div as above. of the class and used in template one. the details of any item one to many or many to many mapping. So here, I have discussed it with a sample example. Now as above at client side, this data is displayed using templating feature. address. It works like foreach. Around a month back, Microsoft announced three plugins as new official plugin for jQuery. In upcoming version of jQuery ( jQuery 1.5) , we would not require to add a plugin for Templating fetaure. This will be part of jQuery 1.5. In my this article, I discussed Templating and in my upcoming articles I will be talking about Datalinking and Globalization. As I already discussed in Introduction section, that jQuery templating provides us a very rich feature to generate the UI without writing much code and in efficient manner. So one should use templateing feature wherever possible. This feature may be very good, where we display the lot of data and also it may get updated. I used it in my application, in almost every page and found it very efficient than server side code. Hope you all will this Article and will give your valuable feedback which will be very helpful for me to write better content next time.